I didn't plan on spending an entire day loading up a bucket with penny rolls and hearing a clamorous crash that, no matter how I expected it, still caused me to flinch and yelp each time. However, admitedly, I do like a simple challenge. I have always maintained that the glue joint is the weakest point in a toothpick bridge, but I didn't really have any 'quantitative' proof of my assertion. 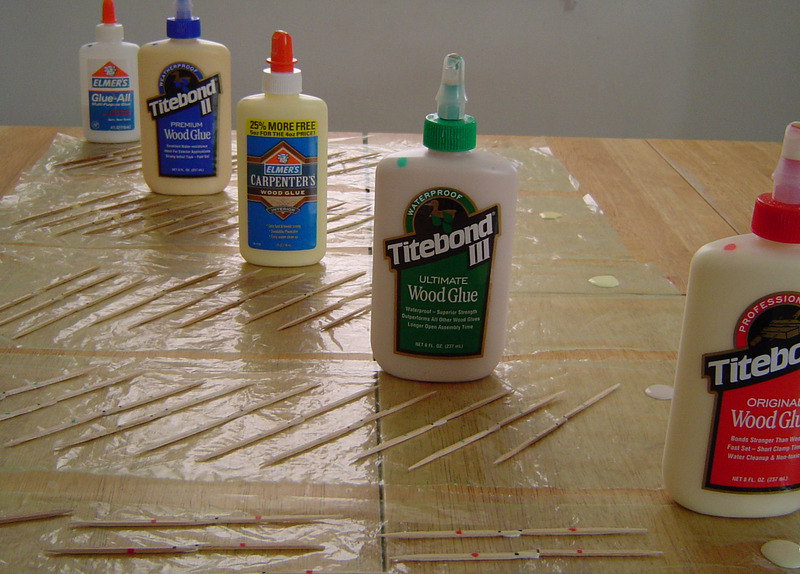 Now, five bottles of glue and 50 simple glue joints later, I can say, the glue joint is still a weak point of the construction of a toothpick bridge. To start with, I decided to make a connection of no more than 0.4 inches of overlap on some nifty round-ended toothpicks I bought a couple years ago when pondering the best way to adjoin round toothpicks. I figured, with one person doing the testing, ten trials of each glue should start to give us an indication if there are any differences in strengths without alot of 'experimental error'. The simplest joint, tips overlapping only 0.4 inches, in a straight line, also reduces the chance for unfair differences on the glues. I did not go to heroic lengths to make things exactly perfect, I simply drew a line across the tips of 100 toothpicks, color coded 20 of each ( for 10 pair) and dipped each end in glue, laid them together, and let them dry. The next day, I had to devise a test to bust them. I thought about making a special clamp to hold each side of the test piece, but vise grips seemed to work pretty well. For weights, I counted out a bunch of spare change and found that 1500 pennies weighs about 10 pounds. Surely that would be enough to bust a single glue joint, right? I really have no preference to brand, it turned out there were several varieties of wood glue at the store, Lowes, and I will use them all eventually. 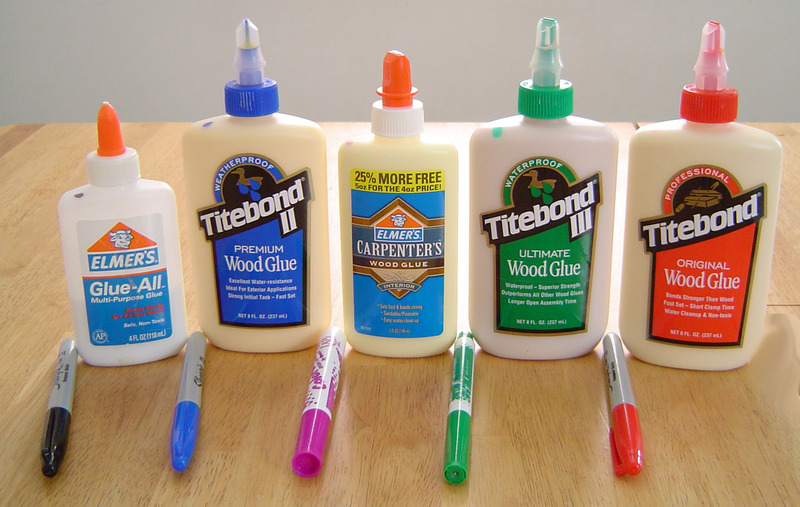 For this test, I included three types of Titebond and two types of Elmer's. Interestingly, the testing was intense. I happen to have some lead weights and penny rolls, so after finding out that 10 pounds is just the starting point for these glues, I added more weight to a bucket suspended an inch or so above a stool -- by a single toothpick clamped in a vise grip, glued to another toothpick with only 0.4 inches overlapping, clamped by another visegrip suspended from the ceiling. It is great to have a place to hang things like this. My hook is actually a bearing that allows things to turn with ease. This helps reduce the possibility of undue twisting on the glue joint. In addition to that, I used a chain to suspend the whole thing, so each link allows for a tiny amount of twisting force to be taken up. After adjusting the vise grips to clamp the toothpick sufficiently without crushing it, I still had some instances of the toothpick breaking before the glue joint. In all but one of these, I re-clamped closer and continued to load until the glue joint failed. So, I bought this scale years ago when my first son was born. It has been a handy thing to have around over the years and today is no exception. 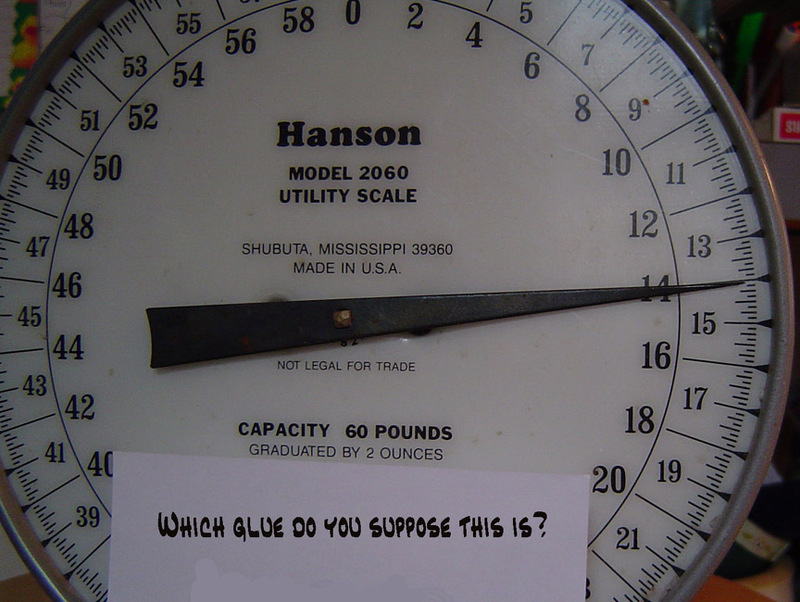 By setting the bucket of weights on the scale at the breaking point, we start to gather data for the different types of glue. Just imagine if you built a bridge with a glue that was twice as strong as someone else with the exact same design and implementation, or, worse, what if you picked a glue that was only HALF as strong as others in the contest. That is the range I found. It was counterintuitive ( a long winded way of saying it surprised me) that one of the worst performing glues was one I might have chosen to build a project with. I would, of course, love to share the data with anyone who is interested, but after seeing my web traffic soar to hundreds of visitors per day, I still have the cost of the glue, the scale, the maintenence fee of my website and other expenses. If you want to know how MY test turned out, you will have to pay. I hate to ask and I will continue to put relevant content on my website whether anyone contributes or not. I am not setting any price, but keep in mind, the fees from paypal make anything under a couple of bucks kind of silly. Any contribution you feel comfortable with. So far, a few people have helped out and it is REALLY great. It has been a couple of months now and I will be adding some photos from a guy who did an really great pair of bridges -- and when I saw the type of glue he used, I was very sorry he did not ask for the glue results...I think he could have withstood almost double the weight. I make no guarantees about my test. I am satisfied and I learned alot from doing it. I suggest to those making an assignment of bridge building to have a team conduct such an experiment if they don't want to make a bridge for some reason. The range of weight suspended by a single glue joint was interesting as well. One glue joint broke at only 12 pounds, another held an amazing 39 pounds. With this information ( the range of force a glue joint can withstand) one can very accurately plan their design.